WHERE: 16th and Mission BART Plaza (Southwest corner of intersection), San Francisco. WHAT: “A PLAZA FOR THE COMMUNITY/UNA PLAZA PARA LA COMUNIDAD”: A highly visual event at the 16th Mission BART Plaza where a coalition of community organizations, merchants, and neighbors will rally and demand a “Plaza for the Community” and affordable housing development that serves the existing community’s needs. VISUALS: The BART Plaza filled to capacity with community members, colorful signs and live music. A lively speaker line-up of community leaders, business owners, neighbors and tenants will speak passionately about WHY the proposed project must be altered. WHY: This event will mark marks the launch of the newly-formed PLAZA 16 COALITION and its campaign to fight a proposed large-scale market-rate housing development for the 1979 Mission Street site (adjacent to the Plaza) and to demand “A Plaza for the Community.” Neighborhood residents, merchants, and organization leaders will share their community-centered vision for a safe and vibrant BART plaza and for neighborhood development that puts affordable housing needs first. WHO: The event is being organized by La Plaza 16 Coalición/ The Plaza 16 Coalition. This coalition has come together to advocate for the 1979 Mission Street site to be used for affordable housing. Our coalition builds on the decades of planning and organizing in the Mission which created Plan Popular and won affordable housing for our communities. The Coalition does not believe the currently proposed development project will primarily serve the needs of the existing community and thus opposes the development until it is tailored to meet the need for truly affordable housing in the neighborhood. 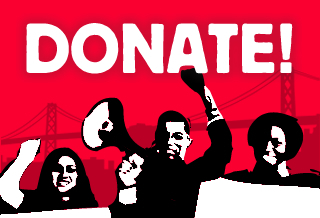 Member organizations include: CARECEN, Causa Justa :: Just Cause, Dolores Street Community Services, Eviction Mapping Project, Housing Rights Committee, Latino Democratic Club, Mission Economic Development Agency, Mission Neighborhood Resource Center, and PODER. < What is Eviction Protections 2.0?